Offering many pro and enthusiast photographers a versatile focal range, with a fixed f/2.8 maximum aperture, it’s an ideal “work-horse” lens for weddings, events, portraits, and press, as well as for general-use photography. There’s plenty of market competition, however, both with Nikon own-brand options as well as with third-party manufacturers such as Tamron and Sigma offering pro-grade alternatives. The Tokina 24-70mm f/2.8 falls squarely into this pro category, offering solid build quality, as well as an ultrasonic autofocus motor and Tokina’s unique manual focus clutch system. Optical construction features 15 elements in 11 groups, including 3 Super-Low Dispersion (SD) glass elements and 3 aspherical elements to help improve sharpness and reduce aberrations, as well as multi-layer coatings to minimize flare. At $999, the Tokina 24-70mm f/2.8 isn’t cheap, but could represent great value compared to own-brand options, such as the $1797 Nikon 24-70mm f/2.8G ED or the $2397 Nikon 24-70mm f/2.8E ED, if it offers comparable image quality. We ran the Nikon version of the Tokina 24-70mm f/2.8 though our industry-standard tests to see how it competes. 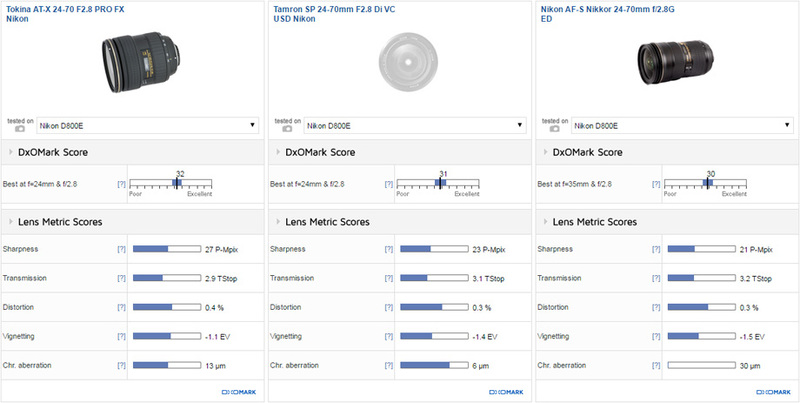 Overall DxOMark scores for the Tokina 24-70mm f/2.8 Nikon range from a top score of 32 points on the 36Mp D800E, dropping to 28 points on the 24Mp D600/D750, and 20 points on the 12Mp D700/D3. The lower scores achieved on the DSLRs with fewer pixels is almost completely due to its lens sharpness results, where the Tokina 24-70mm f/2.8 Nikon scores 27 P-Mpix on the D800E, 19 P-Mpix on the D600, and 11 P-Mpix on the D3. Its headline score of 32 points puts the Tokina 24-70mm f/2.8 in first place for all fast-aperture standard zooms that we’ve tested on the D800E, ahead of the Tamron SP 24-70mm f/2.8 at 31 points and Nikon’s own 24-70mm f/2.8G at 30 points. While all three boast comparable scores for distortion, vignetting, and transmission, the Tokina is ahead for sharpness, with a superior score of 27 P-Mpix, compared to 23 P-Mpix for the Tamron, and 21 P-Mpix for the Nikon G.
The Tokina 24-70mm f/2.8’s sharpness P-Mpix map identifies excellent and uniform resolution at all apertures between f/4 and f/11, often achieving 80% acutance. Resolution at its maximum f/2.8 aperture is not as uniform across the frame, however, with some edge softness at 35mm and 50mm, and reduced resolution down to around 60% acutance at 70mm. At the minimum f/22 aperture, it shows good levels of sharpness, particularly between 35-70mm at f/22, as diffraction doesn’t affect the Nikon version of the Tokina lens as much as it did on its Canon equivalent. Light transmission is excellent, too, maximizing the full 2.8 TStop transmission between 24 and 35mm, reducing only fractionally down to 3.1 TStop at 70mm. Distortion is also well-controlled across the focal range, with minor 0.7% barrel distortion at 24mm and 0.5% pin-cushion distortion at 70mm, thus a limited impact on straight lines. Vignetting, or corner shading, is also well-controlled overall, and is either mild or non-existent at apertures between f/5.6 and f/22. At f/2.8 and f/4, the problem is a little more pronounced, as the lens struggles to achieve the same intensity of light to the edges of the frame at these wider aperture settings. With corner shading approaching ­2Ev at 24mm and 70mm f/2.8, we advise some post-production correction at these settings. Full-frame standard zoom lenses are often prone to chromatic aberration at some settings, due to the varied wide-angle-to-short telephoto range, making it optically difficult to perfectly align all light wavelengths at all apertures. It’s been a particular issue on both the G and E versions of the Nikon 24-70mm f/2.8, where a low score of 30um was recorded when analyzing RAW images, although in-camera processing handles the effect better on JPEGs using Nikon lenses. An overall chromatic aberration score of 13um for the Tokina 24-70mm doesn’t fare too badly in comparison, with the global map identifying less aberration at the long end of the focal range, with some outer field fringing noticeable at wider focal lengths. The problem is particularly noticeable at 24mm, where we advise post-production correction for all aperture settings. Nikon offer two versions of their full-frame standard zoom lens, including the $1797 24-70mm f/2.8G and the newer $2397 24-70mm f/2.8E, which boasts such new features as an electromagnetic diaphragm and vibration reduction. We decided to include the older and cheaper E version for our head-to-head analysis, because of its favorable scores, as well as another thir- party option in the shape of the $1299 Tamron SP 24-70mm f/2.8. Overall scores are pretty close, with the Nikon at 30 points, the Tamron at 31, and the Tokina lens leading the way with 32. This advantage is due in part to its favorable transmission and vignetting scores, but it’s Tokina’s sharpness advantage that really counts. Tested on the D800E, it’s razor-sharp between f/4 and f/11, achieving around 80% acutance at almost all focal lengths for these apertures, except at 70mm f/4, where some edge softness creeps in. The Nikon and Tamron equivalents certainly aren’t bad at these settings either, but they are not quite as sharp as the Tokina overall and a little more inconsistent across the frame at some settings. Overall resolution is down at the minimum f/22 aperture on all three lenses (as you’d expect due to diffraction), but again, the Tokina version delivers slightly sharper results. At f/2.8 however — a crucial aperture on a lens of this type — the Tokina isn’t as strong as the competition. Both the Nikon and Tamron versions are either sharper in the center or more uniform out to the edges — and sometimes both — at this maximum aperture setting, which could be an important factor for many photographers weighing which lens to choose. There’s no appreciable difference among the lenses for distortion and transmission, and while the Tokina lens is ahead for vignetting, the difference is slight. All 3 lenses would benefit from some correction at f/2.8 and f/4, although the Tokina performs slightly better between 35 and 50mm at these wider aperture settings. Chromatic aberration is more significant. As mentioned, the Nikon 24-70 f/2.8G fares pretty badly at most settings, as indicated by the large patches of red on the global map below. The Tamron scores best at 6um overall, and performs well between 35 and 70mm, with minimal correction required. The Tokina offers an improvement over the Nikon, but suffers a little more at the edges compared to the Tamron at some settings. Results at 35mm f/5.6 are indicative of this trend, at which you can see from the field map that the Tamron is excellent across the frame; the Tokina is good across large parts of the image, but starts to fringe a little at the edges; and the Nikon copes well in the center, but poorly in the outer field. 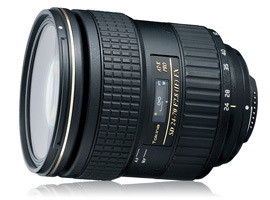 The Tokina 24-70mm f/2.8 is an excellent pro-grade standard zoom lens for Nikon full-frame DSLRs. Tested on the D800E, it delivers marginally better image quality compared to the popular third-party Tamron SP 24-70mm f/2.8 and Nikon’s own 24-70mm f/2.8G, due to its excellent sharpness between f/4 and f/11 at most focal lengths. At the maximum f/2.8 aperture setting, it isn’t quite as sharp as the Nikon and Tamron competition, however, which could be a significant factor for photographers who regularly shoot wide open. At $999, the Tokina 24-70mm f/2.8 is notably cheaper than both the Nikon and Tamron equivalents, too. It lacks image stabilization, which could be important depending on what you’re shooting, but otherwise offers a solid build, and a snappy autofocus motor and manual focus override system. Most importantly, image quality is very good, making the Tokina 24-70mm f/2.8 an attractive third-party option for Nikon full-frame photographers.